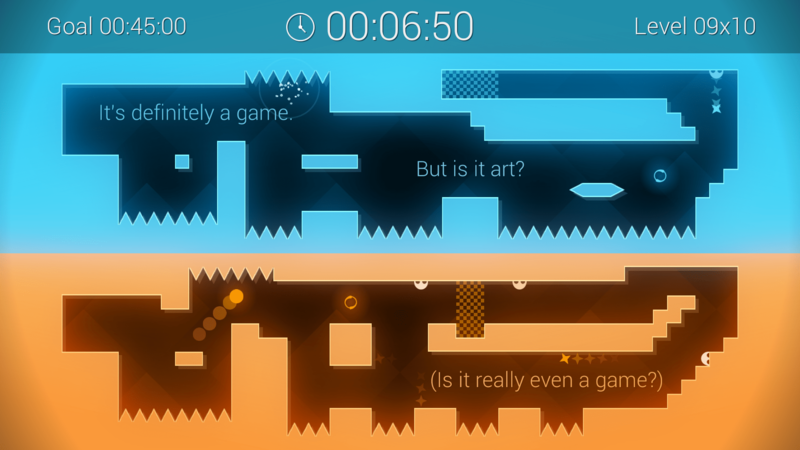 Binaries, developed and published by Ant Workshop, is a difficult and hate filled game. That’s not true about it being hate filled, but it doesn’t try to be your friend either. Each level comprises of 2 coloured balls (orange and blue) that you have to get to their designated end zone. This is simple to understand yes? Well it’s quite the opposite to do. Binaries starts off giving you the simplest of simple tasks, both balls in their end zones at the same time and you win. The difficulty lies in that every key press and action you take affects each ball the same. However, the layout of the map might not be the same. And after the first 3 levels of the game, it starts to get interesting. The game also mixes up the gameplay by having a shared map, rather than 2 separate ones. Oh the fun is just beginning let me tell you! The map will have sections designed purely to kill one of the balls, thus sending you back to the start. The murder of your balls comes from spikes, and projectiles (at least as far as I have gotten). Run over the orange spike with your blue ball though and you will be fine, vice versa equally fine. The spanner in the works is your brain, reflexes, and timing. I was able to enjoy the first 20 or so levels, until I opted to go for the more difficult maps. I could have done more of the same level but I wanted to test my mental mettle. I failed. I failed gloriously and ungraciously. Luckily I was not streaming, or there would have been a lot of hate filled profanity spewing from me… live on the internet. There are countless maps, with varying difficulty, starting off uber easy and progressively the higher on the level selection map you go, the more difficult it becomes. There isn’t really a learning curve however, as the controls are simple and the gameplan more so – don’t get hit. 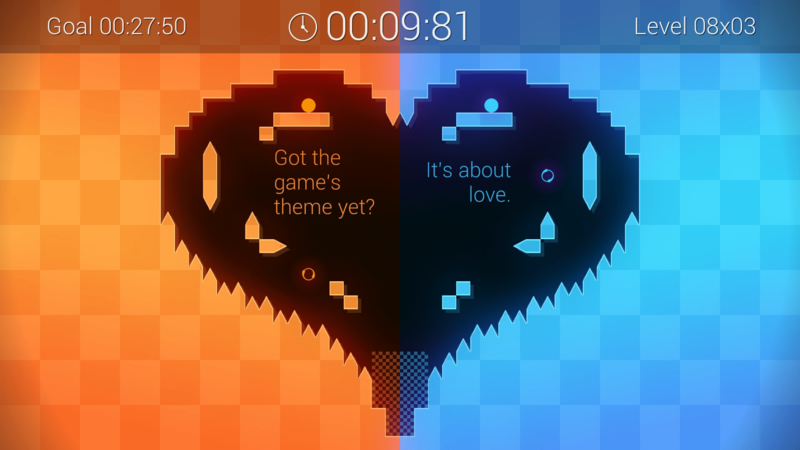 Binaries is far from a bad game, and would be fun for people to face-off against. Maybe not at parties, but a single-sit down challenge would be good if it were streamed, or perhaps as competitive speed runs. There isn’t much to bring you back to the game otherwise. Aside from someone being overly competitive, and wanting bragging rights, Binaries would only be there as a test of your reflexes. Which is a shame as it is challenging and fun to watch people fail at. Binaries seems to be designed for the spectator rather than the player. The player can test themselves against the computers designated scoring system, but the viewer gets to revel in the misery.